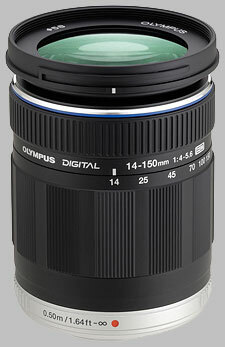 Announced in November 2009, the Olympus 14-150mm ƒ/4-5.6 ED M.Zuiko Digital is the all-in-one ''vacation lens'' for the PEN digital camera. Because of the small size of the four-thirds camera sensor, the lens has an effective field of view of 28-300mm. These figures just correspond to the focal lengths marked on the lens; in actual usage, the widest aperture adjusts quite precisely in conjunction with the focal length setting. As you zoom in and out at the widest aperture, you can see the aperture changing in one-tenth increments. A lens hood is available separately, the LH-61C Lens Hood. The lens takes 58mm filters and will be available shortly for around $700. Generally, sharp images with this lens are best achieved with the lens in the middle of the zoom range (~50mm). Stopping down to ƒ/8 provides optimal sharpness. Shot wide open at wide angle (ƒ/4 at 14mm), the lens shows good results for sharpness, with a good sweet spot in the middle of the frame (~1.5 blur units) falling off to slight corner softness (~2 blur units). Stopping down provides only a marginal gain in sharpness at this focal length at ƒ/5.6, and by ƒ/8 diffraction limiting sets in. By ƒ/11 the corners are creeping up to 3 blur units and the central sweet spot of sharpness is only a small point; by ƒ/16, sharpness is average (~2 blur units in the center, 4 in the corners), and by ƒ/22 the corners are reaching 6 blur units. 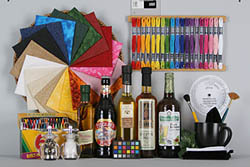 In the mid range, the image is appreciably sharper. By 45mm the largest aperture attainable is ƒ/5.4, so while you won't be blurring out backgrounds with this aperture, it does improve sharpness. At these settings, sharpness is quite good, around 1.5 blur units across the frame, and stopping down improves it further: at ƒ/8, the image is just over 1 blur unit across the frame. Stopping down further doesn't produce further sharpness, but it doesn't show quite the same degradation of performance we noted when used wide open. At ƒ/16 we see just under 2 blur units across the frame; at ƒ/22, it's just under 3 blur units. Zoomed in, the lens shows its flaws to some degree. Our sample showed some slight de-centering at 70mm and greater; performance wide open at ƒ/5.6 is similar to wide-angle performance, a sweet spot of sharpness with corner softness. It's managed by stopping down; at 150mm and ƒ/11, there's a good spot of central sharpness in the range of 1.5 blur units, and corners in the 3-4 blur unit range. Stopping down further doesn't produce any further gains, and by ƒ/22 the lens produces images of around 4 blur units across the frame. Chromatic aberration is quite strong in this lens, but in terms of at what settings you'll notice it, it's all over the map. It's fairly good at 14mm, becoming more noticeable when the lens is stopped down considerably. The best performance (ie., absence of CA) is found at 25mm. At 45mm and greater, CA is strongest with the aperture wide open, and reduces as the lens is stopped down. At 70mm and 100mm, CA is very strong in the corners wide open at ƒ/5.4. There's some corner shading when using the Olympus 14-150mm ƒ/4-5.6 M.Zuiko, but it's not excessive; mostly when using the lens at ƒ/8 or below. There isn't any shading to be found between 25 and 45mm, otherwise the most you'll see is a case where the corners are two-thirds of a stop darker than the center, at 14mm and ƒ/4. The E-P1 corrects distortion in-camera, so it's no surprise that there is very little distortion evident in our test images. There is a fraction of pincushion distortion at 14mm, but otherwise, it's essentially zero. The Olympus 14-150mm ƒ/4-5.6 M.Zuiko autofocuses quickly, going from closest focus to infinity in less than one second. It is virtually silent in its operation, as there is (according to the Olympus press release) only one lens element which moves to focus. Point-to-point focusing is very quick. The front element does not rotate during focus operations. The lens provides average macro performance, which isn't surprising as it's not marked specifically as a macro lens. Its minimum close focusing distance is around nineteen inches, and it provides 0.24x magnification. As all M.Zuiko micro-four-thirds lenses, the Olympus 14-150mm ƒ/4-5.6 is very small, at just around 3 1/4 inches long. The lens doesn't weigh much either, at 10 oz (290 grams). It uses plastic construction to achieve this weight savings, its exterior a matte black finish. The lens mount is metal, and the 58mm filter threads are plastic. 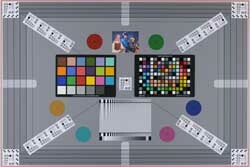 The lens does not have a distance scale or depth of field markings, nor does it have any control switches of any kind. The zoom ring of the lens is plastic with large raised ribs, about an inch wide. The ring takes about 80 degrees to move through its range of focal lengths and turning action is very smooth - firm but not too tight, requiring two fingers to move. There is significant extension with this lens - when zoomed in to 150mm, the lens grows in length by 2 1/2 inches. Given its small size, zoom creep isn't a factor. The focus ring of the lens is an indented ribbed plastic just 1/2 inch wide. The ring uses a ''fly-by-wire'' system to achieve manual focus results, and the E-P1 provides some interesting manual focus functionality. When you turn the focus ring with the MF assist option on, the camera brings up a magnified center view to allow you to precisely focus. The ring will turn forever, as there are no hard or soft stops in the focus ring, and there's no way to know how many ''degrees'' of turning action are available. The fly-by-wire operation does allow for an interesting option: you can set the focus ring direction to either left or right, from the camera's menu. At the time of writing it's not clear whether or not the 14-150mm ƒ/4-5.6 M.Zuiko ships with its LH-61C lens hood; we didn't get one with the sample we tested. The lens is a petal-shaped hood, which attaches via a bayonet mount. There's precious little at this stage in terms of alternatives; just the Panasonic 14-140mm. Normally we'd look at options from Sigma, but while there are some lenses available for the four-thirds mount, none of them cover the same zoom range as the 14-150mm. The Panasonic lens is sharper wide open than the Olympus, and marginally better when stopped down; results for chromatic aberration are also much better, but it's not clear whether that's the lens performance or the camera removing CA in post. Distortion is also removed in the camera, so that's hard to compare as well. Mega OIS isn't necessary in the E-P1, as the camera has image stabilization built-in. Your mileage may vary. For what it offers, the Olympus 14-150mm ƒ/4-5.6 is a very good lens, not the sharpest we've tested but certainly very good for a superzoom. It's marred by some high chromatic aberration at certain focal lengths, but for the wide range of focal lengths the lens offers, it's probably a small price to pay for the all-in-one versatility. Compact size, sharper than DSLR lenses in this range (especially in the corners when zoomed), light. I am a camera collector and user of over 30 years now. I have owned several 28-200, 18-200mm, and 18-125mm zooms from Nikon, Canon, Tamron and Sigma for my DSLRs. This lens is considerably sharper than all of them hands down. all of the ones that I mentioned are very weak in the edges beyond 80mm (especially the Nikon 18-200VR and Tamron 28-200 LD) This 14-150mm is sharp everywhere on my E-PL1 cameras. Highly recommended. This is not a review but an observation based on the tests published on this website. I compared the results of the standard target for this lens against some of the best zooms from nikon and canon: 15-85, 16-85 and 18-140. Dxomark rated nikon 18-140 as the best zoom lens for cropped nikon sensor. Comparing the olympus 14-150 against these 3 lenses it's obvious to me the sharpness is as good or even better than each of the three at both wide and tele, for minimum aperture and f/8. Now, if we take into account the 4/3 sensor is about 1 stop noisier than the aps-c sensors and we compare olympus at 150mm and f/5.6 against any of the other three lenses at tele and f/8, maybe we can say that olympus falls short. However we need to remember its grate range, grater than all the other 3 lenses. So based on sharpness alone i don't think this review is fair. Am i missing something? Please let me know because i'm looking to buy this lens in the near future. I have been using this lens on my E-PL2 for a few moths already (I got it as a kit lens), and I would like to compare it with the double zoom kit I had on my previous Olympus E-510 (14-42 + 40-150). Compared to the E510's dual-zoom kit, this lens offers significantly better depth of field control (this was quite a surprise for me, as the sensor size and the f-stop specifications are pretty much the same), more precise focusing, especially at the tele end, and, also at the tele end the focus is often faster, even if the focusing system is contrast-detect and not phase-detect. The macro performance is significantly improved (0.28 vs. 0.18 without adapter or 0.4 with the macro adapter). Is still not a true macro lens, but at least is usable for some real close-ups (the largest image size is actually 0.8 if you consider the 35mm equivalent). The main drawback of the macro adapter is a rather pronounced blue chromatic aberration in the corners. This can be corrected by software (I use DxO and it does a really fine job) but it might be problematic to use directly some of the in-camera jpegs. My only real complaint is that the zoom ring is too stiff for creative movie recording. While it can be handled really easily for shooting still pictures, if you want to zoom in or out while recording a movie, it is nearly impossible to do it without causing camera shake at an extent that cannot be compensated by the built-in stabilizer. All in all is an excellent kit lens, and if you can get a MFT camera kit with this lens, just go for it! Just for comparison, its is not much bigger than the Oly MFT 14-42 II lens or the Panasonic equivalent, and is just marginally larger than the Sony 18-55 on the NEX cameras, but is much more capable! - I use DxO Optics Pro and it corrects most of its issues: CA, softness, distortion etc. If the focal length reach and its aperture fit you, then this lens is a must-have. I have Panasonic GH2 kit with 14-140mm lens and have read a lot of positive opinions about that lens. Now I can compare panasonic and oly and want to say that I like Olympus 14-150mm more but only for still pictures. Sharpness is noticeable better especially on the long end. So I can recommend it to all who want light and versatile lens. Olympus FT useres have always dreamt of such a Holiday-Lens with good performance, now its real - but not for FT - too bad! I tested against Panasonic 14-140 mm, which is heavier, has built in OIS, comes with Sun-Shade and has a little better sharpness und no chromatic aberrations. Even if it is more expensive, I kept my Panasonic. but for a E-PL1 or E-P 3 its a good and much needet lens for starters with too much money! Optics are good - the first half year, with a bit to much CA. With weekly practice it's getting worse. The price is much to high, it's just a cheap-starter Zoom. The Panasonic 14-140 mm ist by far better. Olympus can do much better.For best possible optical Zoom results, I would prefer the Panasonic 12-35 mm & 35-100 mm OIS!